Photo courtesy of Juozas Salna via Flickr Creative Commons. Nelson and Robinson confirmed early news reporting while appearing on Good Morning America, that they were waiting on an associate, who witnesses confirmed did arrive at the cafe in time to see the gentlemen were escorted out in handcuffs. In their brief visit, both men arrived at approximately 4:35 pm, the subsequent 911 call was placed at 4:37 pm, exactly 2 minutes later. It did not take much time for Americans to discern that the store manager’s actions were unfair and likely driven by bias. Social media rallied for Starbucks boycotts, and national conversations around discrimination ensued. But the public’s criticism of the arrest is not as universal as you might expect. YouGov, a global opinion company conducted a survey to gauge American’s reactions to the incident and placed them in categories: Black, White, Democratic, Republican and self-identified Trump-Supporters. The survey showed a stark contrast in opinion between Trump supporters and most all other Americans, including Republicans. 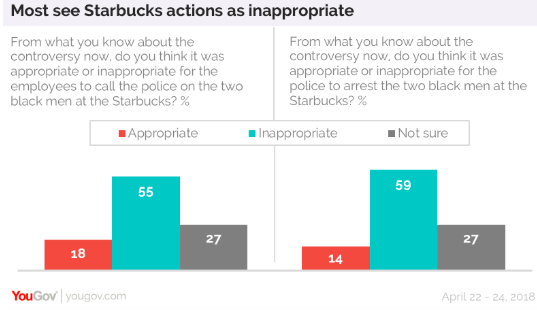 Over half of all survey respondents believe the Starbucks store manager and the local police behaved inappropriately. Trump Supporters, however, found them acceptable. In times of such polarization, rarely is a controversial incident so unifying among Democrats and Republicans! Despite the racial elements of this incident, the survey shows almost unanimous sentiments held by both Blacks and Whites — but hopefulness quickly gives way to when presented with the fifth group, Trump supporters. (1) Skepticism or denial of the existence of implicit bias, and it’s potential to harm others. (2) Unwavering support of law enforcement in any issue involving law enforcement. Trump voters surveyed held the strongest opposition to the implicit bias training. While many acknowledge that as flawed beings, we all hold some level of bias toward things and people, this level of intellectual honesty is not highly valued by a subgroup of the country. This group cannot differentiate implicit prejudice from the intentional evil of racism, an is also adamant in their denial of racism and deeply offended by accusations of racism. For context, Fox News Host Laura Ingraham was none too pleased with Starbucks or the American public and took to her show to condemn Starbucks, and the greater American public. In true denial, during her April 18th show, she groaned: “one employee does one thing, and all Starbucks employees are presumed to be racist!” She went on to state Jones jumped to conclusions by initiating company-wide bias training. 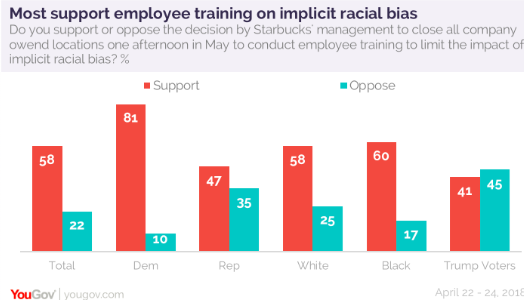 The fact is, Starbucks CEO Kevin Johnson stated emphatically that implicit bias training was an important education for the ethical operation of the chain. Contrariwise, to limit training to one location would appear far more accusatory than training all American chains. To further demonstrate her ignorance, she added insult to injury with her silent premise that political affiliation nullifies one’s ability to hold prejudice is both ignorant and prejudice. All Ingraham demonstrated, is that Trump supporters jump to conclusions as quickly as the race-baiters they so despise. To equate the company-wide training with a top-down accusation of racism is grossly irrational and borderline pathetic. Another troublesome deviation is tied to law enforcement, specifically, how helpful or harmful, different segments of Americans view law enforcement. To be clear, failing to call the police can have dire consequences. But race and politics weigh heavily on our national opinions of law enforcement officials. As mentioned before, the 9-1-1 call came shortly after the two men arrived at the café. Knee-jerk 911 calls are a genuine problem because details are rarely relayed to dispatched officers, who must arrive on scene prepared for dangerous confrontations. For example, it was not relayed to the 911 dispatcher that late 12-year old Tamir Rice’s ‘gun’ was ‘probably fake,’ per the caller’s post-mortem admission. In the case of the Starbucks arrests, it was not related that the gentlemen had only occupied space in the café for 2 minutes before they made the manager uncomfortable enough to call the police. Calling the police is more than a safety measure, it is the epitome of escalation. Again, reporting a crime to the police is just good common sense. Should calling the police to report an actual crime result in excess police force we cannot place blame on the citizenry. Unfortunately, there is widespread denial of excessive force by among Trump supporters, a denial fueled by the President himself. The dogmatic narrative of a victimized police force began when the President was still a candidate. He was quoted stating: “Police are the most mistreated people in America.” He went on to say they have been forced to live in fear, knowing that doing their jobs well will (actually) cost them their jobs. Bottom line: calling the police is more than a safety measure, it is the epitome of escalation. A verified law enforcement official released an open letter on Reddit pleading with the public to take this fact to heart, asking people to stop calling in “suspicious behavior” when they see black people where they aren’t used to seeing them. Tragically, Trump supporters have created a de facto Police-Card, functioning similarly to the Left’s ‘Race-Card.’ As a result, any evidence of racism is rebuffed and fuels their mission to ignore or downplay racism within American society. Ultimately, what is most disheartening about the pro-Trump reaction to the incident, is that the gentlemen who were actually arrested have no interest in a political agenda. In fact, the grace and cooperation exhibited by both Donte Robinson and Rashon Nelson exemplifies much of what Trump supporters say we ought to, no matter how hostile our encounters with law enforcement become. Post-incident, despite the opportunity, Robinson and Nelson have yet to voice contempt towards law enforcement. These two issues are just some of the reasons Trump supporters wouldn’t come to the table on the Starbucks arrests. Still, the bipartisan consensus is encouraging. “What I want is for young men to be inspired by this, not traumatized,” said Robinson. Simone Cherie (Price) is a nonprofit advisor and development consultant. Her development and fundraising experience ranges from regional non-profits to nationwide candidates for public office, most notably conservative and pro-liberty causes, including Freedom Partners, Americans for Prosperity and Tea Party Patriots among others. Born in Portland, Oregon, Price began her career with Oregon Republican Party and was credited with helping the state to blueprint its entire online presence, launching its first social media websites and annual campaigns. Price was published by the Southeast Philosophy Congress at age 20 for her work entitled ‘In Defense of Christianity” and became a contributor to the National Center for Public Policy’s Project 21. Price received the Betty Rendel Award from the National Federation of Republican Women and has been regularly featured as a commentator or guest writer on an array of media outlets, including the Washington Post, CNN’s New Day Saturday, and the Hill. She was selected as one of the Maverick PAC's Future 40 Under 40, and inducted into Who’s Who Publishing’s, Who’s Who in Black Atlanta in 2016. Price has described her political views as ‘fiscally conservative and culturally cognizant with a strong libertarian streak;’ she is a graduate of Emory University. Imerspsive brain power at work! Great answer!